Supercharge your Dell System with a Dell Memory upgrade engineered, tested and customized for your system. 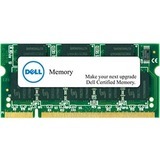 Dell Memory is another great product from Dell - high quality at an excellent price. Adding more memory revs to your system's engine and allows you to release its full potential when working with 3D imaging, multimedia, and other memory intensive applications. With Dell memory we also offer a limited lifetime warranty and the benefits of Dell's service and support. Maximize the value of your computer investment with an easy-to-install, reliable Dell Memory upgrade. Trust only Dell Memoryfor your next Dell system upgrade!